Horror film It Follows centres around nineteen-year-old Jay (The Guest’s Maika Monroe) who after a sexual encounter with her new boyfriend Hugh (Jake Weary) finds herself plagued by a mysterious, malevolent entity which relentlessly follows her. I got the chance to sit down with the film’s writer-director David Robert Mitchell ahead of the film’s UK release, and here he tells me about avoiding the jump scares found in horror films today, how the film’s subtext originated, and much more. Have a read below. David Robert Mitchell: I’d always seen it as a horror film but maybe a little different or unique or whatever my version of that would be. There’s a lot of different elements that are going into the film. It was definitely supposed to be an interesting mixture. AW: How did you come up with the subtext for this film? DRM: I think there’s a lot of different levels to it, and all kinds of ways to read the film. I don’t think there’s just one thing. Some people say it’s a reference to STD’s and HIV, which I think is interesting and I definitely was aware of that when writing it. But I don’t know that it’s the one thing the film is about, at least for me, but I think some people will see it that way. AW: What did you learn about your process making your first film, The Myth of the American Sleepover, that you took into this one? DRM: That’s tricky. It’s hard to say exactly. Some of it is just the way I handle the logistics of the day. But they’re very different, in terms of approach. That film was primarily cast with first time actors so they were just very different experiences. That was a low budget movie – it was shot for about $30,000 – and so that movie was just about getting the movie made, just somehow scraping the film together. This was definitely not a low budget film but there was a budget and Maika [Monroe] and all the actors were professionals. So it made things easier for me. What I was craving was an opportunity to flex some creative muscles a little bit and be able to do some interesting things visually and push things a little bit. I’m really proud of that first film, but I wanted to show a little bit more. AW: Do you still get scared watching the film? If not, what do you do to make sure you’re on the right track when you’re writing and filming? DRM: I definitely play the film for friends and people that I trust to gauge reaction and to try and get a sense of what works and what doesn’t. Especially with a horror film, it’s important to play it for other people because it’s about creating a feeling that becomes very difficult for you to feel because you’re so close to it because you’ve seen it so much and you know it so well. AW: You wrote as well as directed. How much of the original script was changed or altered as you were filming and as the actors took more ownership of the roles? DRM: I was certainly changing things in the script as we went along, but a lot of that had to do with just practical logistics and money to be very direct. It was just about what you can actually pull off and achieve. As for the film it certainly takes a different shape once you start playing the scenes and actors become those characters and they do change in small ways. AW: What do you enjoy more – writing or directing? DRM: I love and hate writing – it make me really happy when I’m doing it – but I’m also a little tortured sometimes when I’m doing it. Same thing for directing and production. There’s good and bad from both. AW: You see a lot of jump scares in horror films today, but It Follows largely avoids going down that path. Was that a conscious decision? DRM: Yeah. That stuff is fine and I don’t have something against it. It wasn’t really the point of this movie. It was more about conveying the feeling of dread. If there’s a low level feeling of dread throughout then it’s working. And I do have a couple of jumps in there, but it’s sort of a trend that for me is not actually scary – it’s just startling – and I’m not that interested in being startled. I’d rather have something maybe be disturbing or cause anxiety. For me, it’s a little more interesting. It’s not hard to make people jump, but that is not the same thing as being scared. This entry was posted on March 2, 2015 by Amonymous. 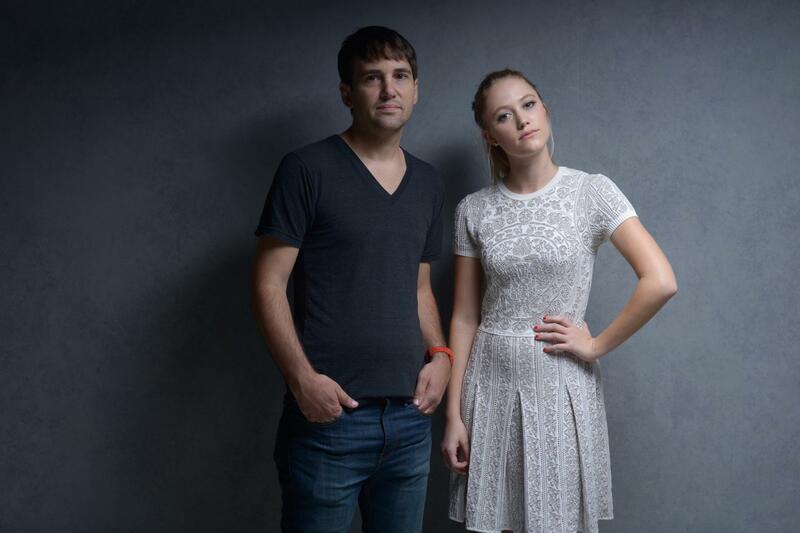 It was filed under Interviews and was tagged with david robert mitchell, it follows, maika monroe.